Germany is in so many respects so much further with responsible and sustainable processing and production methods than many other countries here in Europe. There’s such a strong local manufacturing of eco products, with use of honest materials, but the research for new, innovative materials, which allow new product design and at the same time leave less of a footprint on this world, is a trend I’ve also been noticing in Germany. I’ve written about the admirable production processes of the German clothing label Macarons before, the wonderful eco-wines of Weinreich, but also toy manufacturer Gommini is such a company. 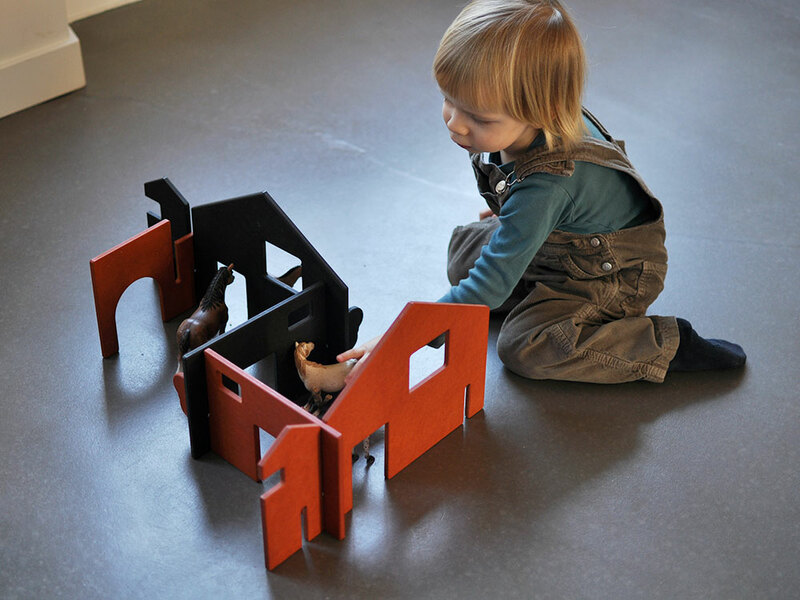 Gommini uses Valchromat for their toys, a high-quality, solvent free, wood-based material which contributes to an efficient and responsible environmental management and encourages sustainability. The products are then treated with a purely natural oil, resulting in a very smooth and pleasant feeling, ‘soft’ surface. I love the modern look of their products. 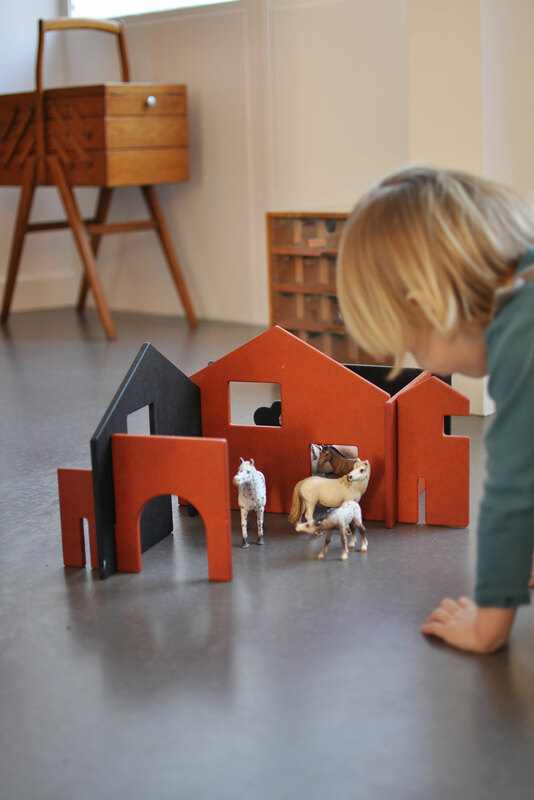 We gave our children the Minigoms play scene for Christmas — a selection of 2D buildings, landscapes and openings that can be assembled and combined in different ways. 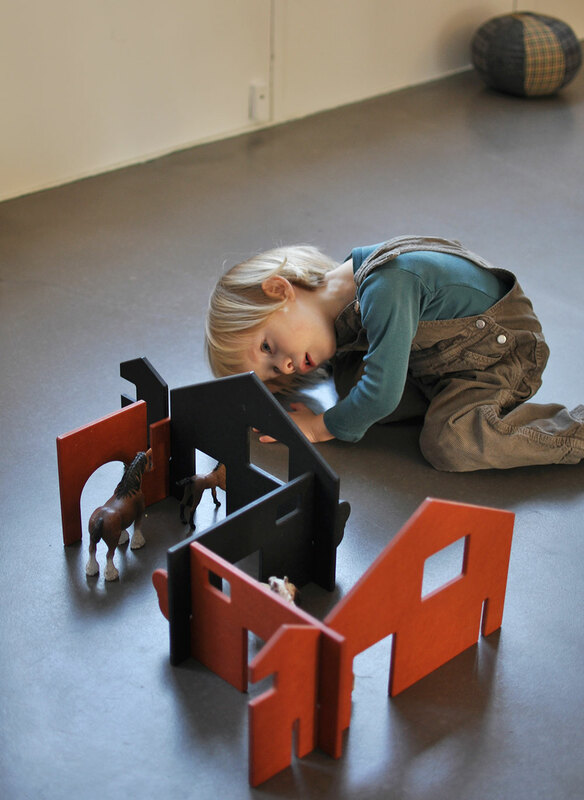 The toy is not offering a fixed scenario — it can be used in all sorts of manners, allowing for the input and creativity of the child. It can for instance be a stable for the Schleich animals, a garage for the cars, a city for the train track, a house for the Playmobil characters, etc. It’s been a grand success by all means — it’s easy to assemble, wonderful to play with for all ages, pleasant to look at, and easy (flat) to store. If you’re ever looking for an evergreen kind of playhouse for your children that will stand the test of time, then this Gommini Minigoms playscape is certainly something to keep in mind. Love, love the fact that it can be stored flat. And it’s adaptable. Really clever. You always have great recommendations for toys! Love this, and checked out their other products too. I really miss living in Germany, it’s a great place to raise kids. Your point of view is pretty interesting! I often think it’s like tilting at windmills and more people should act ecologically responsible (can you say this?) but yes, there are so many great things going on!! Sometimes you got to look from the other side of the border 😉 Nice find and I love Casper in the first picture!! !